NOW READ the current issue online for FREE! Simply click the cover image! You can still grab a FREE Print RTR Magazine at your local bike shop! 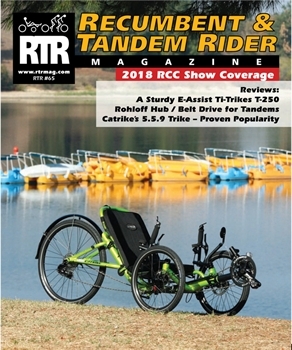 RTR Magazine is the world's only magazine dedicated to the riders and enthusiasts of tandem and recumbent bicycles. In each issue you will find bike and equipment reviews, riding tips, travel stories, technical advice and maintenance ideas from some of the leading tandem and recumbent cycling experts. Copyright © 2000-2019 ~ Coyne Publishing. All Rights Reserved.